All frames are zinc alloy metal and polished to a bright mirror finish. 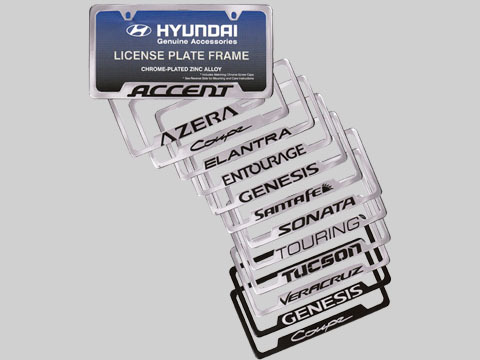 (Genesis and Coupe frames also available with a black powder coating with a clear epoxy finish). Price is for one frame only. All frames come with stainless steel mounting screws and screw caps. Please check local laws before installing. The license plate holder is very classy with an attractive finish. The matching screw covers is an added touch of elegance. I am very pleased with the license plate holder. Simple and efficient order process. Quality control process obviously lacks as the product came missing screw caps. No time to followup so I made due with what I had. Due to this issue and knowing the cause is a quality control process, would not order again from the Hyundai Accessory Store.